In my role as Community Life Pastor at Redeemer Fellowship, I have the privilege and honor of officiating a few weddings a year. It’s alway a joyous time of celebration with family and friends. But if I’m honest, I get more excited about what comes before as I meet with a couple and help prepare them for what lies ahead. I typically take them through a book that deals with what to expect and how to respond, especially when things don’t go according to the perfect plan they had in their heads. 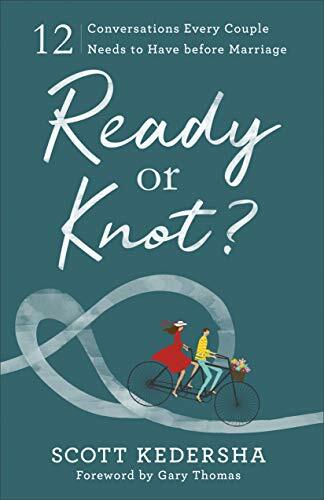 In his book, Ready or Knot?, Scott Kedersha has added his voice in a way that will help couples thinking about marriage prepare for this lifelong covenant. I’ve read several books on the subject of marriage... by all the big names, and a few smaller known names as well… and I’ve come to this conclusion: Scott is adding something I haven’t found in other books; at least not as explicitly or as clearly. For me, it was unique … and needed. What sets this book apart from others is Scott’s all-encompassing view of intimacy. Scott tackles the different kinds of intimacy head-on and by name. By chapter 3 he is laying out spiritual intimacy and why it’s important. Chapter 4 is on relational intimacy and how it needs to continue to grow after the wedding day. Chapter 7 is on emotional intimacy. Chapter 8 is on sexual intimacy. You get the idea. He hits the key areas of intimacy that sometimes get missed, and he does it in a refreshing way. This book also covers other important areas couples need to be talking through such as: communication, financial stewardship, biblical roles and kids. Another unique feature is how it deals with topics like: how to deal with parents/in-laws, and the need for community. The entire book is filled with personal testimonies as well as questions at the end of each chapter to help couples talk through each section. If you are engaged, thinking about getting engaged, or are a pastor who works with engaged couples, this book is a must. This will become my new “go-to.” It is biblically and doctrinally accurate while at the same time a fun easy read. It goes on sale February 5th. If you need extra incentive to pre-order, the author is giving you bonus material here. Order it here. Preorder it now, you won’t be disappointed.